Really, it’s too much to expect any normal man to behave like a staid accountant in order to inherit the fortune he deserves to support the lifestyle of an earl. So when Derek Saunders’s favorite elderly aunt and her ill-conceived—and possibly fraudulent—Lady Travelers Society loses one of their members, what’s a man to do but step up to the challenge? Now he’s escorting the world’s most maddening woman to the world’s most romantic city to find her missing relative. While India Prendergast only suspects his organization defrauds gullible travelers, she’s certain a man with as scandalous a reputation as Derek Saunders cannot be trusted any farther than the distance around his very broad shoulders. As she struggles not to be distracted by his wicked smile and the allure of Paris, instead of finding a lost lady traveler, India just may lose her head, her luggage and her heart. I picked up The Lady Travelers Guide to Scoundrels & Other Gentlemen because the title promised a fun story. I didn’t even read the blurb on the back. I needed an audiobook…the one I came for was checked out…this title caught my eye as I was walking by. Thankfully, I didn’t once regret this impulse read! Side Note: I initially though The Lady Travelers Guide to Scoundrels & Other Gentlemen was written by the same author as a book I had previously read. A book I will review later this week. I was wrong but you could understand my confusion: Tasha Alexander and Victoria Alexander as somewhat similar names. I will start this review by saying that I only seem to enjoy reading romance around the holidays. Don’t ask me why. Maybe it is something about that time of year as I only seem to like Hallmark movies around the holidays. Who knows…. So, I may have slightly groaned when I finally realized The Lady Travelers Guide to Scoundrels & Other Gentlemen was a historical romance. I wasn’t really in a mood for a romance; however, I was in the mood for something funny, so I kept listening. I didn’t stop laughing! Guys, I was laughing OUT LOUD on my morning drive to work. Any book that can make me laugh at 6:30 in the morning is worth its weight in gold! The characters were hilarious; kudos to Victoria Alexander! This book is full of well-rounded, colorful, and unapologetically human characters. I instantly connected with India as her brutal honesty, with both herself and everyone around her, is a trait we share. I also understood her frustration with the awkward self-growth she struggles with. I adored Derek, as his attempts to reign in his aunt’s fraudulent activities and attempts at subterfuge with India were endearing. The banter between Derek and Val had me in stitches every time! 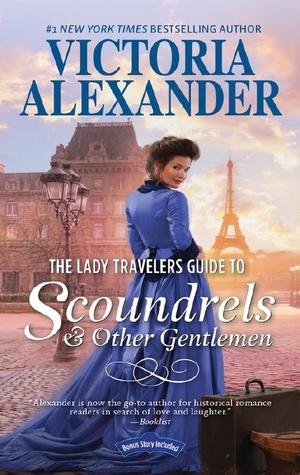 The characters are what made The Lady Traveler’s Guide to Scoundrels and Other Gentlemen such a wonderful read. I was invested in their journey, and their happiness. Plus, Alexander provides us with a unique lesson on love and acceptance. So now for the negative points. I only have two to share. First: The Lady Travelers Guide to Scoundrels and Other Gentlemen starts SLOW. I attribute this to India’s rather abrasive personality. She is a hard character to like for the first quarter of the book, but don’t let that deter you. I promise it gets better. Second: the book blurb (once I finally read it) promised a mystery. The whole catalyst for the story is India’s search for her missing cousin, and I expected to read more about the actual search. We get a few details, but sadly the search is very limited, as neither India or Derek are expert investigators. I was slightly disappointed the mystery wasn’t a more prominent aspect of the story. I still enjoyed it! And I picked a mystery up once I had finished this audiobook. Have I been converted into a romance fan? No. But I am now a fan of Victoria Alexander, and you bet I will be picking up the prequel novella, How to Stop a Wedding in Seven Days or Less, and the sequel, The Lady Travelers Guide to Larceny with a Dashing Stranger. The sequel is scheduled for release December 2017 and I will have to beg my library to pick up the audiobook version! I anyone else a fan of Victoria Alexander? Have you read The Lady Travelers Guide to Scoundrels and Other Gentlemen? Let me know, and definitely pick up this one if you need a good laugh!